I was so thrilled when I found out I could participate in the “For the boys” Blog hop. I loved making things for my 6-year-old son. It is so exciting when I see him loving the things I made for him….its the best reward I can receive. I hope these inspire some ideas for the boy/s in your life. These are some of the things you can find in my son’s bedroom. 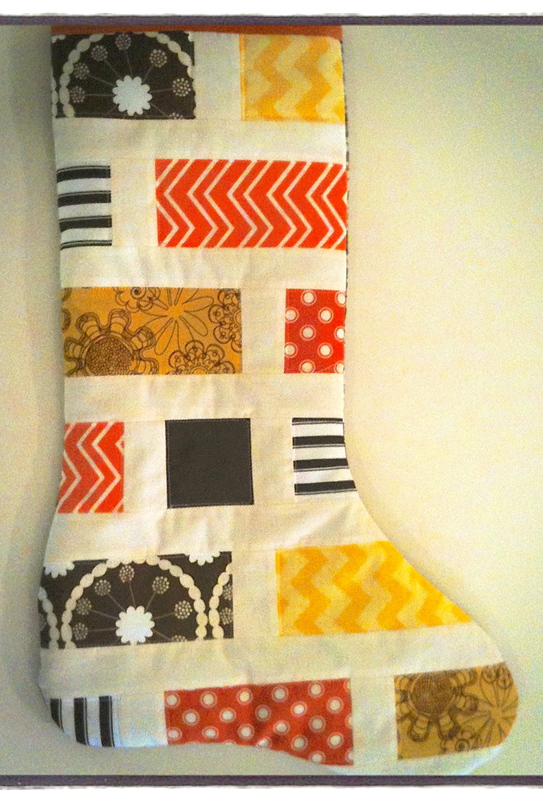 Finally, how about an idea for Christmas…Christmas stockings for the boys. It Seams to Be Sew…. Finally don’t forget to check out the yesterday’s book review + giveaway here. 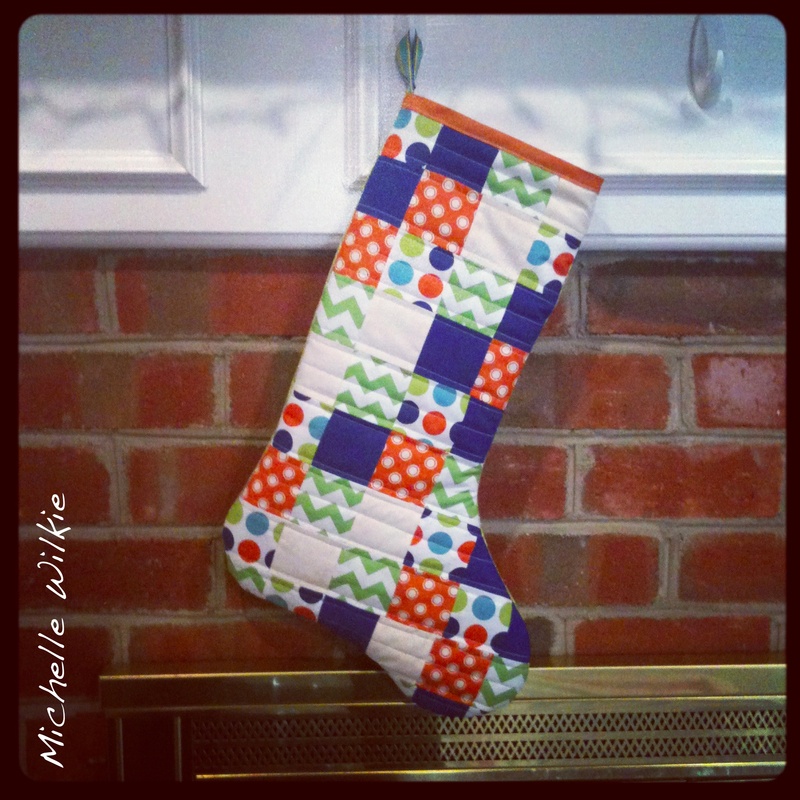 This entry was posted in Uncategorized and tagged chair bags, chair pockets, christmas, christmas stockings, crafts, Dr. Seuss, For the boys, growth chart, quilting, sewing, wonky universe on November 13, 2013 by mlwilkie. What wonderful ideas for boys! The Dr. Suess grow chart is fantastic. Thank you for sharing. What a great room! You have made him some super stuff! Love the star cushion. Oh, oh, oh, how I love your Dr Seuss. Sam I am. I am Sam. No, I do not want green eggs and ham….enough eh? Love your little pillow too. Looks snuggly! Great great projects. Love the growth chart and the pillow. The stockings are super cute too. Great boys things! I really love the painted wall! pretty cool boy stuff…which one did you do for this hop? I love the pillow and the chair bags! Oh I just love it!! It is so unique…what little man wouldn’t want that!! His room is all totally cool! Wow so many cool projects!! WOW!!! These are all geat, could not even begin to imagine which would be my favorite- just want to move right in! What wonderful projects! I’m sure your little boy is feeling really lucky to have a mother like you! What a lucky little boy! His room is fabulous, and your artwork is wonderful! Thanks for sharing. Great projects! 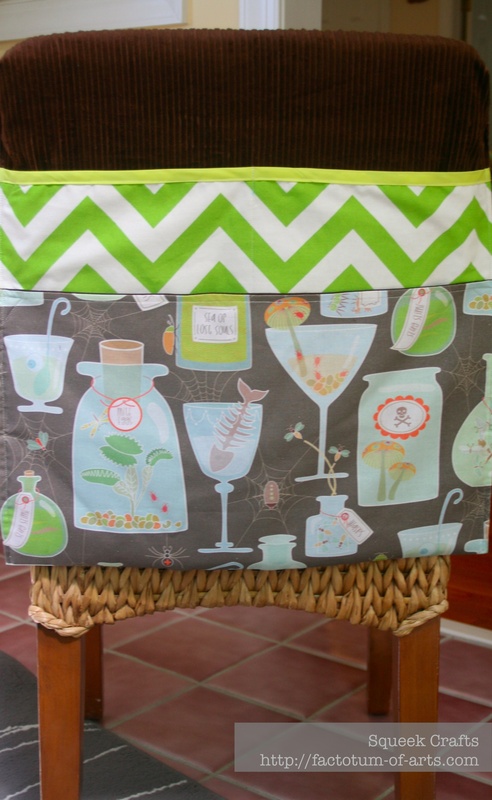 I love the chair bag; a great place to leave little surprises and where little boys can stash their treasures before they eat!! Wow! What a great room for a little boy! There are so many wonderful projects in there. I really like the Dr. Seuss growth chart and the chair storage bag. Thank you for sharing. 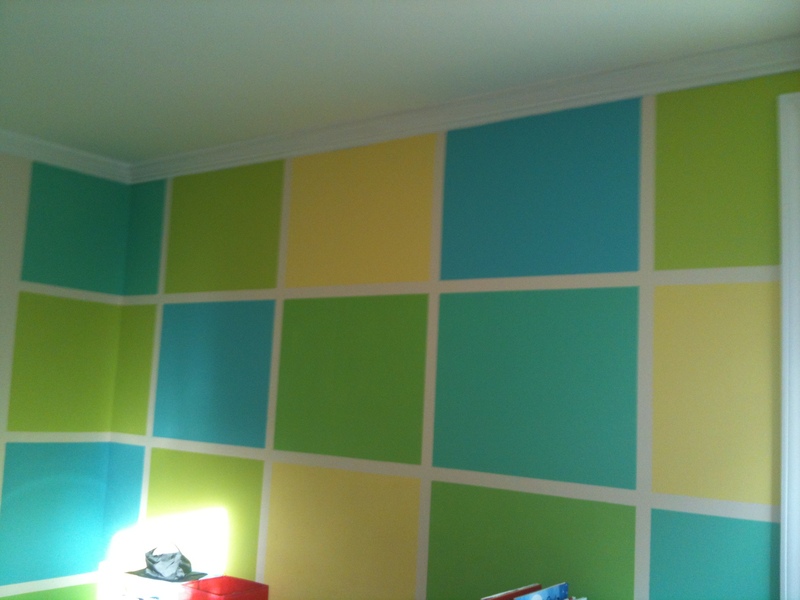 Great things in a boy bedroom, the wall is painted very neat too. Oh my goodness…so many amazing ideas for boys! He is such a lucky kid! Loving that pillow, but all your projects are wonderfully creative! The pillow is my fave, too! And the Christmas stockings are awesome! Ho, Ho, Ho! Did you know? Only 41 sewing days left to go! That is an awesome room,any boy would love! That pillow is fab,need to make one myself,thanks for sharing. Fun room! I love Dr Suess! You are so talented with the many things that you have shown today. I bet your son just loves it. Does he give you suggestions or show your artistic talents too? Wonderful ideas for boys, thank you very much for sharing! Fabulous ideas for boys. Love the growth chart. Your growth chart is over the top. Love all of your other contributions too. Your projects are all great. You truly got it For the Boys. You are a very busy lady! Dr. Suess is terrific. The stockings are so cool too. OMG. All your projects are great. Great projects. I love the square painted wall. Some great projects for the Boys! Love the pillow! On a non-quilty note, the wall is quite awesome. Thanks for joining us!! What a wonderfully creative post! Thanks for all the coo projects. 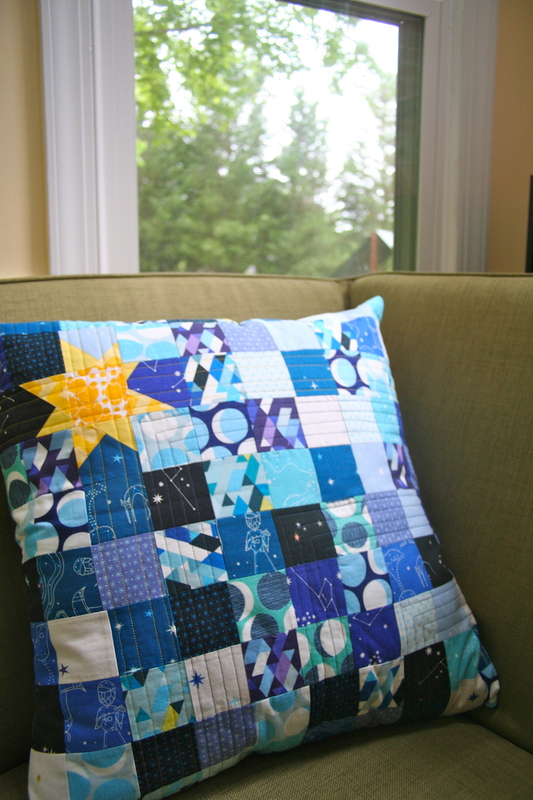 I especially like the wonky star pillow and think I may just have to make one soon. Thanks for sharing your talents and creations with us today. What GREAT xmas stockings!! Like none I’ve ever seen! Fantastic, love the growth chart and wonky universe pillow! Love the Dr Suess growth chart and all your creative projects. Thanks for sharing. Wonderful projects. What a lucky boy to have such a creative mom! Love the universe pillow and the chair bag is a fantastic idea and one I’m going to remember – perhaps I need one, too.